Compiles any BASIC program without modification - gives up to 40% speed increase. Includes a comprehensive toolkit, with renumber, search & replace, single step and block handling. Please note, this is the 3.5" disk version, so you must have an add-on 3.5" disk drive for your Spectrum. 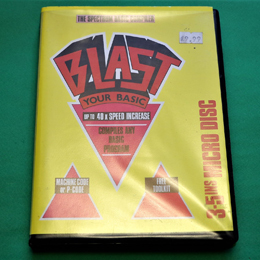 I don't currently have one, so the disk is untested, although I have sold several copies of this NOS software and all have been OK. Just return for a refund if it does prove to be faulty.